Millions of children across the United States benefit from mentoring every year. 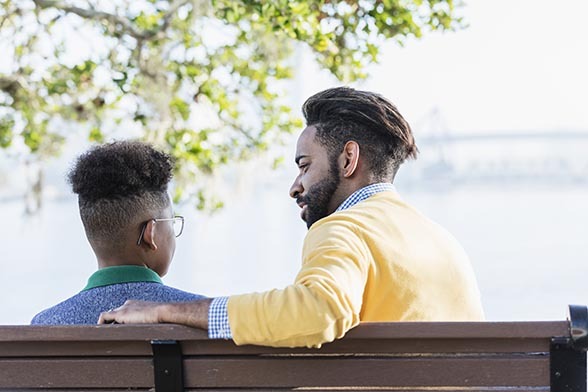 These relationships, often facilitated by one of the nation’s approximately 5,000 mentoring programs, support youth with the goal of improving their social and emotional development, strengthening their academic performance, and reducing juvenile delinquency. In 2012, the Office of Juvenile Justice and Delinquency Prevention (OJJDP), part of the U.S. Department of Justice, implemented the Mentoring Enhancement Demonstration Program (MEDP). The program included the addition of advocacy and teaching roles for mentors, as well as focused training and support with the goal of promoting positive, longer-lasting relationships with mentees and stronger positive outcomes for youth. AIR conducted a rigorous, evidence-based evaluation of the MEDP, examining implementation of enhanced program practices and comparing outcomes for youth who received the program’s interventions with those of their peers, who participated in the traditional mentoring programs. This evaluation was conducted by AIR and its partners, Carla Herrera (consultant), Janet Forbush (consultant), Thomas Keller (Portland State University), and David Altschuler (Johns Hopkins University). The evaluation showed that participating agencies on average developed more than four new enhanced practices. Such practices included strengthening staff support to help mentors take on teaching/advocacy roles, establishing new online training modules for mentors, providing structured opportunities for mentor-youth matches to engage beyond typical offerings, and facilitating in-person support meetings for mentors to interact with each other and staff. Some enhancements were online components (i.e., mentor blogs, an online portal for mentor support, and online trainings) that unintentionally created challenges for successful implementation and mentor participation. These online components were often entirely new practices, rather than modifications to existing practices. Implementation quality depended on supportive and engaged leadership, established mentoring practices, and a clear vision to implement enhancements with fidelity. Random assignment to receive mentoring with MEDP enhancements did not have statistically significant direct positive or negative effects on mentoring relationship quality or youth outcomes. There was, however, no indication that mentors in the intervention group took on significantly different roles with regards to advocacy and teaching. Mentors in the enhancement group received higher levels of training and support than mentors in the non-enhancement group. Receiving higher levels of training and support was associated with improvements in match relationships and youth outcomes. Youth experienced accentuated improvements, such as better conflict management, positive affect, seeking help, problem solving, and fewer conduct problems when their mentors had backgrounds as helping professionals and were exposed to the MEDP enhancements. Overall, most mentor program staff reported that MEDP led to key improvements in their programs, including increased partnership-building, enhanced match support, stronger relationships between staff and mentors, and more effective mentoring relationships. Read the full report.